The Russian Defense Ministry wants to order a tank tailored for urban warfare - a modernisation kit for the field versions of the T-72 and T-90 tanks to reinforce their armour for urban areas and equip them to drive over piles of rubble and barricades. “To overcome obstacles, the urban tank will be fitted with a bulldozer blade/scoop – a feature so far used only in US tanks that have been upgraded with the TUSK (Tank Urban Survivability Kit) system. 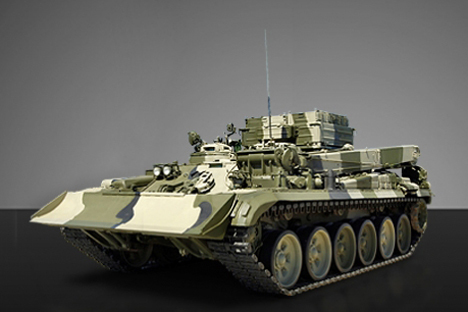 In addition, the tanks will be reinforced with armour plates across the bottom to make them less vulnerable to land mines and roadside bombs, as well as with slat armour tiles to protect the hull against anti-tank weapons by detonating the warheads before they reach the armour”, a source in the Defence Ministry told Izvestia. The Main Automotive and Tank Directorate of the Defence Ministry is now putting together design specifications and mission requirements for such a kit. Work should be completed this summer and followed by a tender for the contract. It has already been determined that a combat vehicle equipped with an urban warfare kit will be expected to withstand missiles from RPG-7 and RPG-29 rocket-propelled grenade launchers, as well as land mines having power equivalent to several dozen kilograms of TNT. The new kit will also include some additional blocks of reactive armour (explosive reactive armour tiles that drive the missile away upon impact). The military expect the urban warfare kit to be mounted on combat tanks in the near future. “Suppose a tank battalion is supporting infantry in an urban environment. The urban warfare kits will be delivered from warehouses, and then the maintenance personnel will install them. After the mission is complete, the kits will be disassembled and taken back to the warehouse”, the Defence Ministry source said. The components for the kit are being designed by the Steel Research Institute (NII Stali) – a think tank that has already developed samples of reactive armour, slat armour and other components. “What we have to do now is choose an optimal kit in terms of the ‘cost-performance’ ratio. We plan to launch large-scale production rather than producing one-off kits. The larger the lot, the cheaper an urban tank will be”, the source said. A source at NII Stali told Izvestia that urban warfare kits were unlikely to cost any less than $200,000–$250,000 each. Meanwhile, a tank troop officer from the Southern Military District brigade explained to Izvestia that conventional tanks are not suited for warfare in an urban environment among houses and other structures because they are vulnerable to short-range missiles. This vulnerability was largely the reason behind the failed attempt to take Grozny by storm in 1995 when Chechen militants shoulder-fired rocket-propelled missiles at tanks from the roofs of nearby buildings. “A tank is first and foremost a fighting vehicle for open terrain combat, where there are different ranges and different angles of impact. Designed to sustain major frontal impacts from a distance of 700m to 2km, it has the thickest armour in the front. In an urban environment, however, missiles are just as likely to hit its back or sides where the armour is considerably thinner, and from a distance of a few dozen meters rather than 2 km. One rocket-propelled missile fired from an RPG-29 launcher is actually enough to destroy a modern tank”, the officer said. Will the SS Satan-18 missile be replaced? However, the urban warfare kit would be too heavy to carry in open terrain, limiting a tank’s general mobility and increasing fuel consumption. For this reason, the kits should be easily removable. Independent military expert Alexei Khlopotov told Izvestia that similar urban survival kits have already been designed and put to practice elsewhere in the world. “The US has the TUSK system for M1 Abrams tanks with the same features that the planned Russian analogue is supposed to have – additional armour, slat armour protection against hollow charge grenades and missiles, etc. France has developed the AZUR (Action en Zone Urbaine) for its LeClerc tanks. Germany is also developing a similar kit for its Leopards. The US troops used the TUSK system extensively in Iraq, and the French are now using AZUR in Afghanistan”, Khlopotov said. The USSR started developing an urban warfare modernization kit in the 1970s. In particular, an upgrade system with additional armour and slat shields was designed for T-62 tanks for the war in Afghanistan. The efforts were discontinued, however, after the breakup of the USSR.